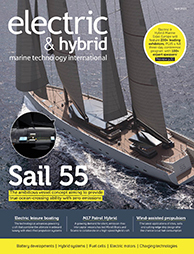 The two companies agreed on a distribution partnership earlier this year, initially for yacht manufacturers in Italy. In February, Akasol delivered eight of its high-performance AKASYSTEM 15 OEM storage systems – each capable of 150kWp / 25kW – to the Italian market. The first customer for Diesel Center’s 300kW hybrid drive system is Italian firm Sanlorenzo, which will incorporate the system into its 105ft-long (32m) superyacht SL 106 Hybrid project. The new hybrid-powered cruise ship MS Roald Amundsen, being built for Norwegian cruise line Hurtigruten, was launched at Kleven Yards in Ulsteinvik, Norway, on 17 February. Following its delivery in the summer of 2018, the ship will deploy on expedition voyages to Antarctica and the Chilean fjords in its 2018/2019 inaugural season. The unit is a part of Hurtigruten’s two-vessel order, placed with Kleven in April 2016. The deal includes two more options, which would be handed over to their owner in 2019. Featuring a length of 450ft (140m) and a width of 77.5ft (23.6m), the two ships, named Roald Amundsen and Fridtjof Nansen, will be able to accommodate 530 passengers and 151 crew members. Both set for delivery in the summer of 2018, Roald Amundsen and Fridtjof Nansen are intended for voyages in polar waters and will have strengthened hulls for traversing ice. Hybrid technology, combined with the advanced construction of the hull and effective use of electricity on board, will reduce fuel consumption and CO2 emissions on the ships by 20%, according to Hurtigruten.